Can you imagine life before Content Marketing World? I can’t, and I will only be attending my third year of this information-packed conference this week. What Joe Pulizzi, Cathy McPhillips and the rest of the team at Content Marketing Institute have built over the past 7 years is truly amazing. Each day is filled with learnings from top content marketers, fun games and lunch and learns and awesome after-parties. Below you’ll find fun some highlights from our involvement from Content Marketing World’s inception, to happenings at the conference this week. Enjoy! As I mentioned earlier, 2017 will be my third year attending Content Marketing World. But for a select few that have been around since inception, this will be their seventh Content Marketing World Experience. One of those lucky few is TopRank Marketing CEO Lee Odden. Lee has not only attended every conference since 2011, he is one of even a smaller number of speakers that has presented at each and every one. By the second year of the conference, content marketers were hooked! There were over 1,000 attendees from 23 different countries. Officially making Content Marketing World the largest content marketing conference on the planet. For our team at TopRank Marketing (and me personally) there was another exciting opportunity on the horizon. In preparation for the 2012 conference, we partnered with the team at Content Marketing Institute to develop the first-ever conference eBook. This eBook uncovered top content marketing secrets from 29 of the speakers at Content Marketing World. This was a new experience for me and I was incredibly honored and excited to work alongside Lee and the speakers to create this amazing asset. Be sure to stop by Lee’s Big Brand Influencer Marketing session today for more about this story! 2014: Content Marketing in Wonderland is a Hit! For the third year in a row, Content Marketing Institute and TopRank Marketing partnered to bring conference attendees inside insights from top speakers at Content Marketing World. And this year, we leveled up. Big time (with some major help from Content Marketing Institute’s designer, JK). The audience was hooked! In fact, there were over 323,000 views of the series on SlideShare alone. For the rest of the series see Content Marketing ROI, Audience Development and Content Marketing Strategy on our SlideShare page. September 2015 was an exciting time. I was about to head to Cleveland for my first taste of Content Marketing World. I was accompanied by my fellow team members Josh Nite and Alexis Hall. And while our road to Cleveland was a bit bumpy (if you see me at CMWorld ask me about it), we finally got there safe, sound and excited for the experience. Also, the big picture conference theme lended itself to yet another great opportunity to co-create content with some amazing speakers. For the rest of the series see Big Picture of Content Marketing and Making Content Marketing the Star of Your Marketing on our SlideShare page. For his awesome help with the design, we sent JK a new sketchbook. And in return, he drew this lovely portrait for us! This year may be our biggest year yet! In addition to the workshop Lee ran on Tuesday that provided insights on creating an influencer marketing strategy, he also has a solo session today on Big Brand Influencer Marketing which is a must-see. And since I know you were waiting for it, we have our latest partnership with Content Marketing Institute, the In-Flight Content Guides featuring insights from 2017 speakers. For the rest of the series see Creating a Memorable Content Experience and Making the Most of Your Content Journey on the Content Marketing Institute SlideShare page. Hope to See You at CMWorld! 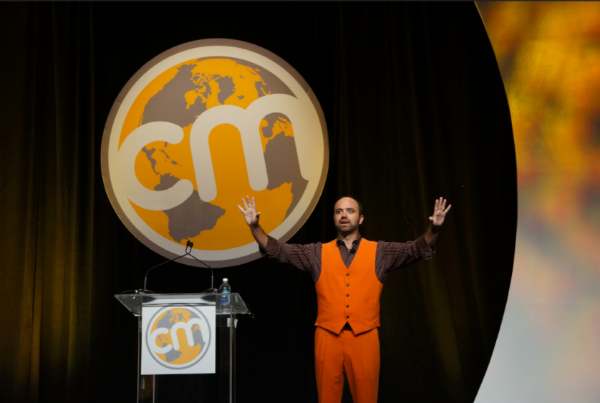 The post An Ode to Content Marketing World: A Look Back at Some of Our Favorite #CMWorld Moments appeared first on Online Marketing Blog – TopRank®.